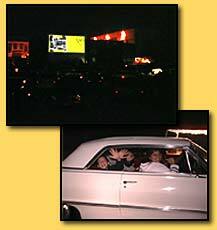 In September of 1999, Five Star Productions introduced the first Mobile Drive-In Theater at Pitney Bowes in Stamford. This was the first portable Drive-in Theater in Connecticut. Come and take a "scroll" through our photo gallery with highlights from past events and a sound clip from our historical first event. It all came to life when dedicated staff and volunteers joined together and made this event successful and memorable for everyone involved. 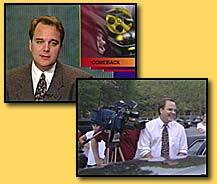 Our debut attracted various forms of media attention. Cablevision's own David Springer joined us to interview our guests and capture highlights for the evening news. Our drive in theater is more than just a movie. We provide a wide range of entertainment. Before showtime, you could see a classic car exhibit, enjoy live entertainment, movie trivia, be a contestant on our game show and much more. 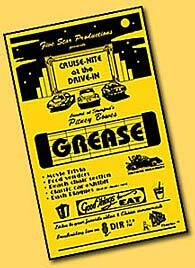 It's not unusual to find classic cars at a Drive-in Theater. We feature classic car exhibits showcasing some of Americas most popular automobiles. We encourage everyone to admire them and to vote for their favorite car. 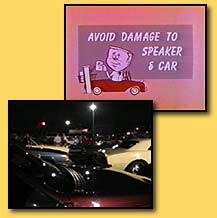 How many of you remember the small tin box speakers we hung on our windows, which sounded more like fast food drive-thru speakers? Like most drive-ins today, the movie sound track is transmitted through your FM stereo and from our sound system in front of the theater. Everyone enjoyed fresh popcorn, candy, hot-dogs, hamburgers, ice cream and soft drinks at our refreshment stand. 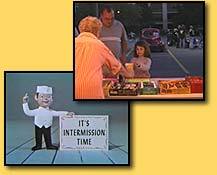 Of course the drive-in experience would not be complete without seeing the old intermission clips on the big screen. Now it is time to sit back and enjoy the movie on our 48 foot diagonal screen. For some it's a new found experience and for others it's like being a kid again. As the evening ended and the credits rolled under the moon lit sky, we decided to ask our guests what they thought of their first Mobile Drive in Theater experience. 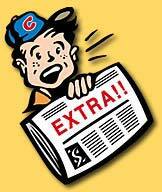 We really must thank the media and particularly the Stamford Advocate for their extensive coverage of our events. Earlier that year the press helped promote our efforts to reintroduce one of Americas favorite family pastimes. 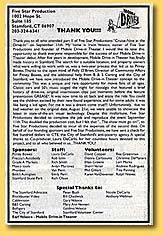 The Advocate recognized the efforts of everyone involved with this Thank You Article released on Sunday, September 26, 1999.